Half the year, Boracay’s a fun summer getaway with calm waters and warm sun perfect for swimming and sunbathing. But what do you do the other half of the year when it turns into a literal wet blanket, with huge waves and frequent rainshowers? My friends and I were lucky or unlucky to be in Boracay right at the turn of the season from dry to wet. We landed under a clear sky, but incoming rains washed out our second day’s plans at the beach. So, we turned to other pursuits… like riding a Zorb. 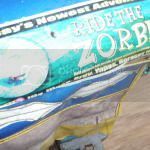 Er, wait a minute… what’s a Zorb? It’s a very large transparent plastic sphere with a hollow core. People get into that core and then roll downhill. I’d seen a small feature on TV about this extreme sport when it started in New Zealand, so I was definitely excited about trying it for myself. Zorbing had just started on the island the previous week, so even the tricycle drivers didn’t know exactly how to get there. Our trike had to go past Alta Vista de Boracay resort, then take a turn to the left and climb a steep hill. Since the trikes don’t have very powerful engines, each trike was limited to carrying 4 people (excluding the driver) and the drivers charged each of us P50 per way (P100/person for the round trip). We had two ride options: the harness ride where two people are strapped into the core opposite each other, and the water ride where one to three people can climb inside the Zorb, have it partially filled with water, and then have the hole plugged so they could roll downhill on a cushion of water. We all opted for the harness ride (P350/person). Ideally both riders should weigh the same give or take five kilos, but the Zorb is safe to ride for people with up to a 20kg weight difference. None of the riders should weigh above 80kg though. So my friend and I were strapped in, and once we started rolling down that hill, I couldn’t stop screaming! Part of it was I got freaked by a leg strap coming off, although I should have known I was completely safe because the chest straps and centrifugal force would hold me against the inside of that Zorb. It was a thrilling ride and gave us something to be busy about that rainy afternoon. The gloomy weather actually helped, as we realized during the summer it might get stifling hot inside those Zorbs. Next time I might try the water ride, but only if I were wearing the right gear, like a rash guard and a one-piece swimsuit. 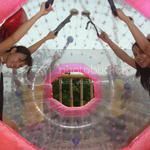 We were told a Korean tourist had gotten disrobed the other day during her Zorb ride — yikes!